"I was not sure what to expect going in. From the trailers I was not a fan of the alien designs. Plus I have a personal grudge against CGI 3D sometimes that I won't let distract this review. Also, it's Dreamworks (Hit and miss). Thankfully 'Home' is a Hit. The story is charming, the friendship is wonderful between the two leads. Even the side characters are quite funny. The main human lead, Tip, is such an amazingly constructed 3D model. 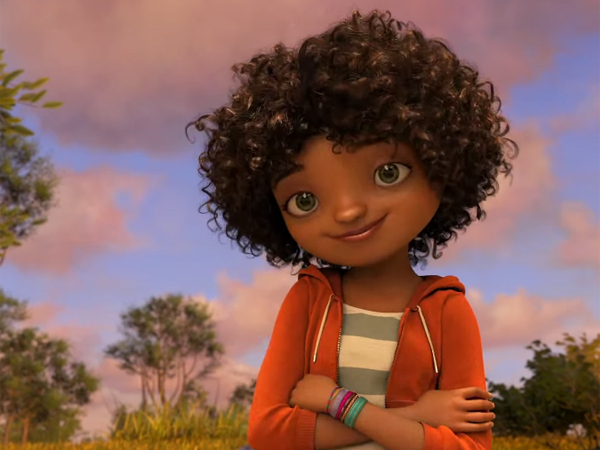 Definately one of the best designed female characters in CGI film so far. Plus, I was shocked to discover Rihanna did the voice! And she is excellent! While the story is charming it does rely a lot on emotionally drawn out musical moments. Personally I believe there are way too many of these. On the other hand, it does give the animators a brilliant chance to flesh out that character animation, it looks so good. I really liked the scenes where the two characters were wondering around the city. The idea of one human in this taken over world is very enjoyably apocalyptic. My biggest complaint about this otherwise wonderful film is it does the stupid Disney 'you think they're dead' ending. Blimey, have we not seen that enough? Alan Partridge and Spongebob have already made the best jokes with it. NO MORE. It's predictable, yes, even to the kids. It took me completely out of the moment. I'm sorry if you think this is a spoiler. I don't see it as one as it did not push the plot or character development in any way. Soundtrack is not too bad either with Red Balloon by Charlie XCX as well as a really good track by Rihanna, Towards the Sun. If you're going to the cinema and you can't find anything to watch, go see this great flick. If not, just wait for the DVD. You're not missing out on a masterpiece."